An epic picture book about a brave band of brothers, lost and looking for a new home. Will they find it, across the sea, the mountains, the desert, through endless labyrinths and beyond the edge of the world where strange beasts are lurking? And will they stay together? And how will they know where they are going if they are all wearing protective helmets? 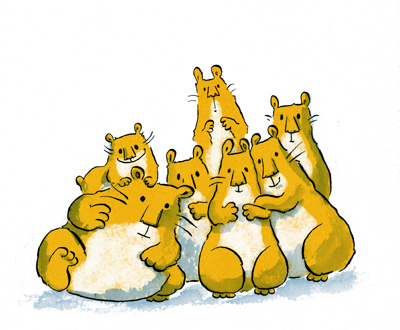 Find out in this book, which made me laugh like nothing else I ever illustrated (hence the wobbly lines in places), and which Alexis Deacon wrote because he knows I like to draw epic hamsters.